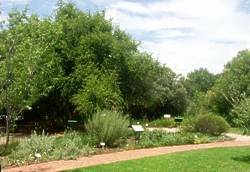 The Waterwise Garden was established in 1998 in a joint venture between the South African National Biodiversity Institute (SANBI) and the then Department of Water Affairs and Forestry (DWAF). This project is one of many initiatives that encourage efficient ways of utilising water in our country. Waterwise gardening cuts down on water wastage, while preserving the beauty of a garden and the natural plant diversity of an area. In this garden you will find plants that help South Africa save water. This garden was created by grouping plants according to their water needs. Ziziphus mucronata (buffalo thorn tree), with its spreading canopy, was used to create shelter and shade in the garden. This has a cooling effect and prevents the soil from drying out. Waterwise plants found in this garden include Bulbine frutescens, Melianthus comosus, Crinum bulbispermum, Aloe maculata, Clivia miniata, Artemisia afra and Carpobrotus edulis. Most of these plants are adapted to save water through their leaf structures which are waterproof and stop water molecules from being absorbed into the air. Visit the garden and learn more on how to prepare your garden for the beautiful alternatives, such as groulping plants with similar water needs in the same beds, improve your soil’s water retention and how to water correctly.